The storied characters of the London grime scene reflect on the mythical genesis of the musical movement in a new film Open Mic, by documentary photographer Ewen Spencer. Spencer, who was documenting grime as it was born in the youth centres, pirate radio stations and raves of East London, goes back to all the key players in the scene to get their take on how and why the phenomenon started and was able to take root. Artists like Wiley, Dizzee Rascal, Kano and Lethal Bizzle describe how grime took elements of garage and mixed it with a generation of frustrated young people in Hackney and Tower Hamlets in the early 2000s to create its unique industrial sound – “the sound of the estates”. Spencer reveals iconic footage of early battles and performances and traces the growth of the genre as it blows up – “out of the estates and into Top of the Pops” – with new interview material that looks back on the events with the benefit of retrospect. 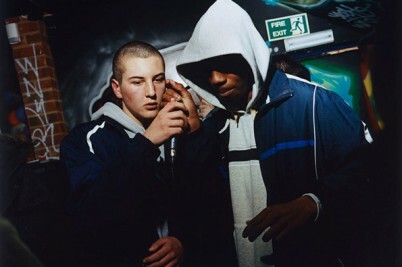 Although the film is a real celebration of the subculture, Spencer allows the trail of thought to develop freely as artists, producers and critics question the evolution of grime and whether it needs to return to its roots. To that end, Spencer allows his camera to wander to Birmingham where a vibrant grime scene is flourishing, more in line with how the genre started. By following all these tangents of grime, Spencer paints a picture of the scene that is open-ended and observational – a document of a time and a place that produced one of the best, and perhaps the last, authentic, offline subcultures in the UK and beyond.